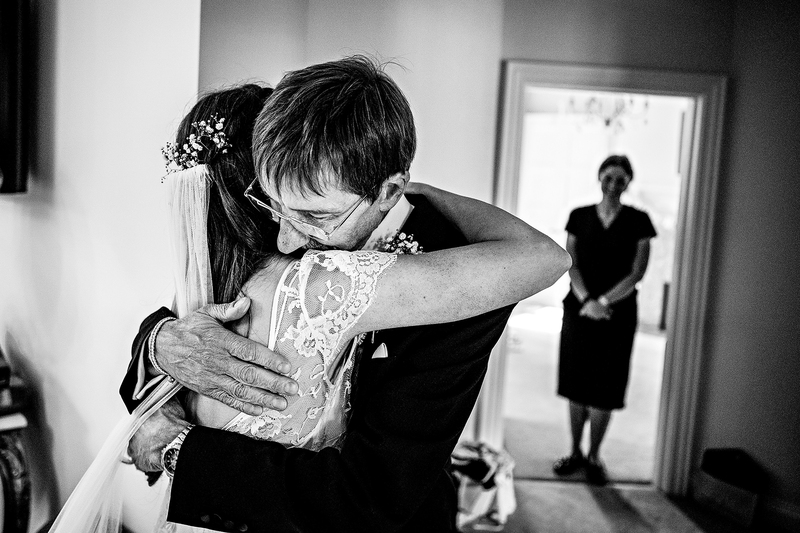 Covering Hannah and Gary’s wedding was a real privilege as a wedding photographer. 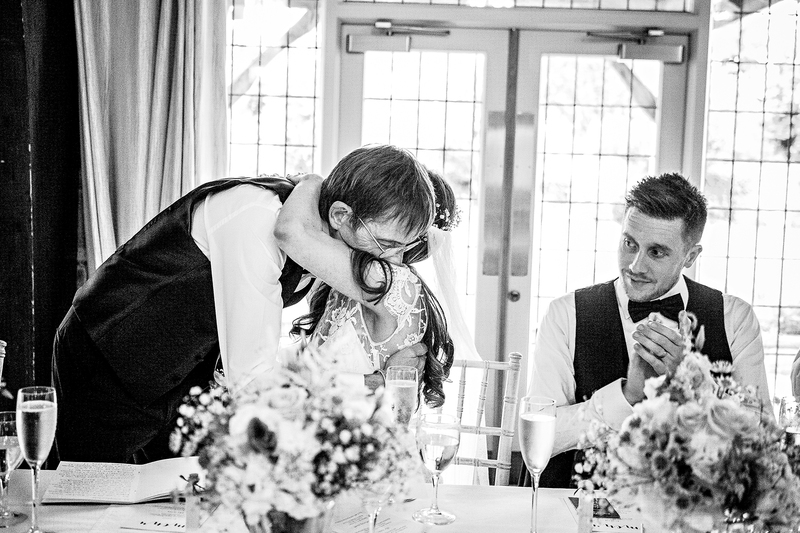 The couple celebrated at Colshaw Hall in Knustford, Cheshire. 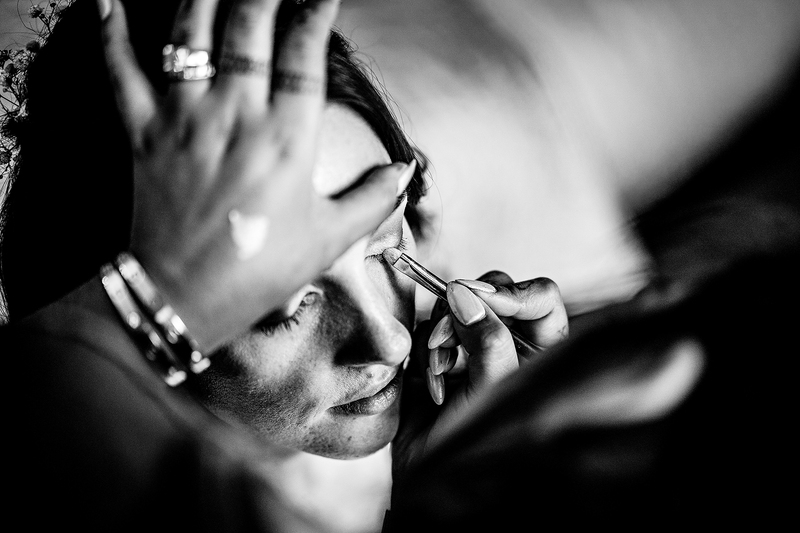 I was charmed to photograph a wedding at Colshaw Hall. It is an exquisite location for weddings, and the first time I had ever been there. 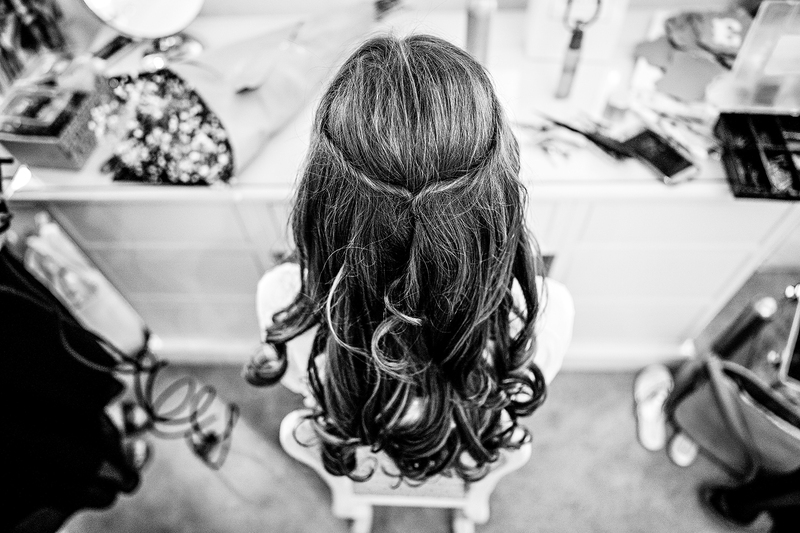 The Bridal Suite was a perfect place to begin Hannah’s wedding photography. 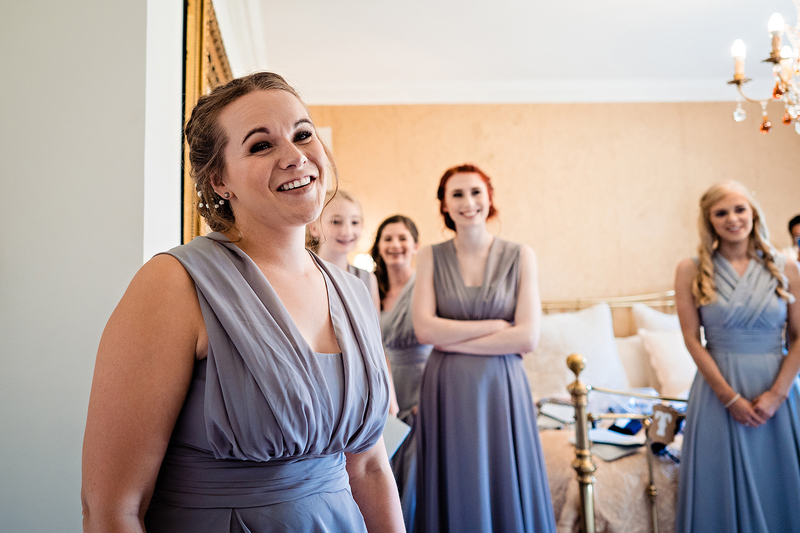 Hannah was there with all her bridesmaids so it was a very active seen to photograph with loads going on. 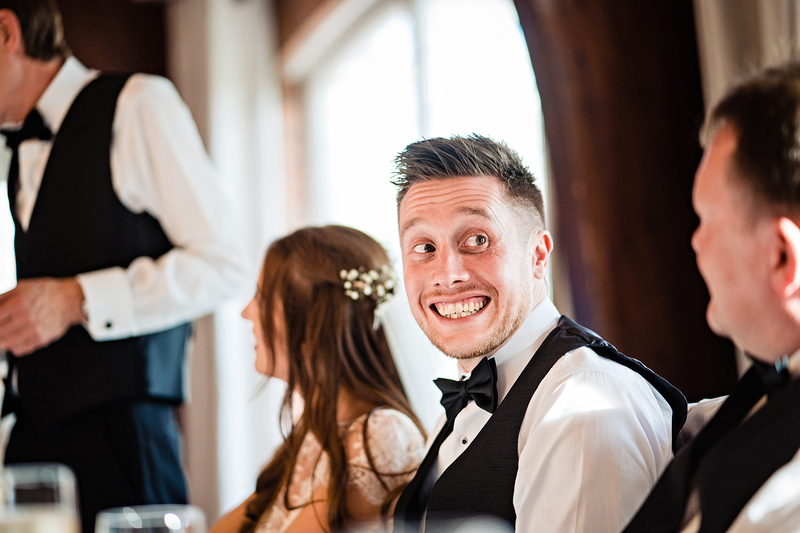 That nervous energy that’s complimented by excitement. The music was playing and everyone was slowly getting more and more ready for the day ahead. 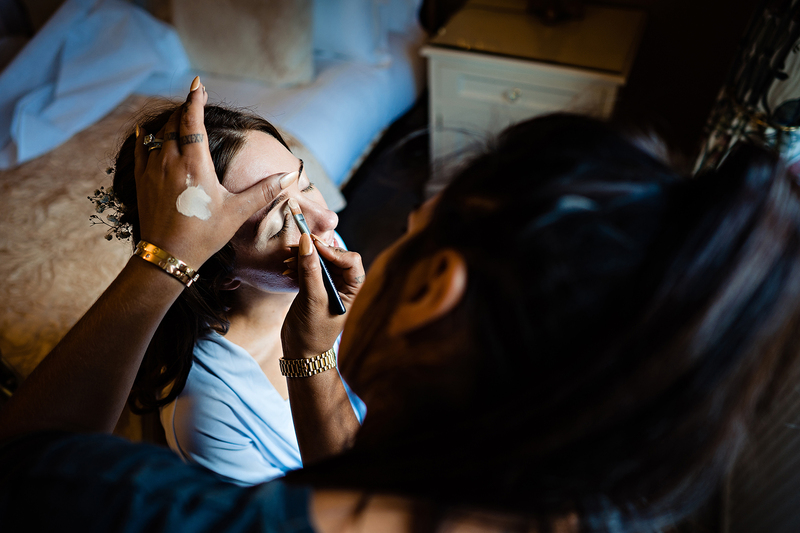 Laughter and smiles in each room as the final touches were being done to the bride and her maids. 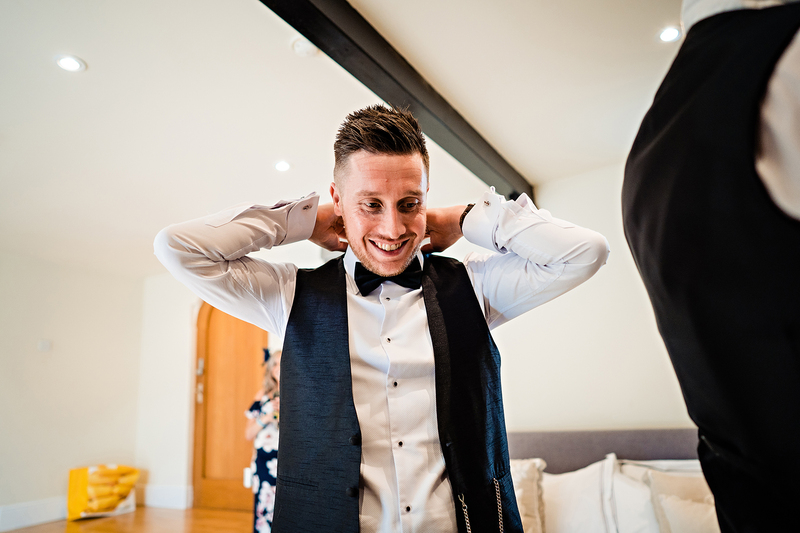 Gary also wanted his story to start during his prep, so I began taking photos while he was getting ready down in the Cottages. Colshaw Hall is spread over quite a large area. With bedrooms in the Hall itself as well as some small but beautiful cottages close by. 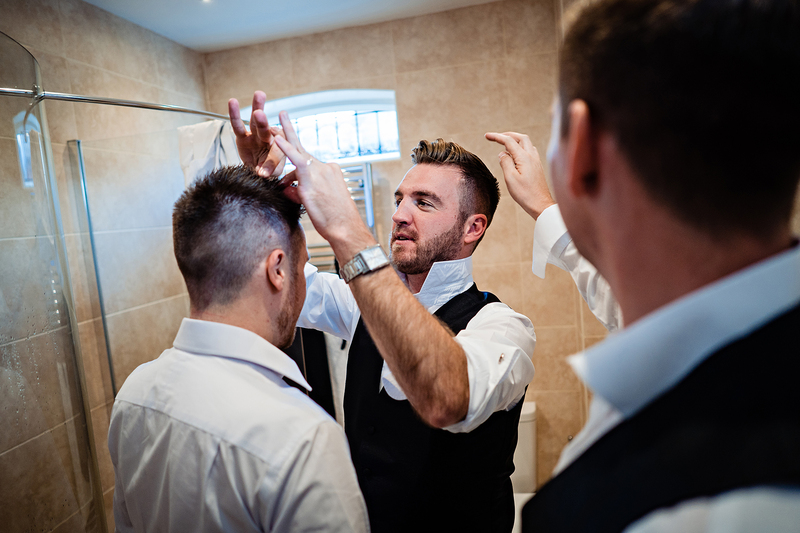 Gary was with his groomsmen making the final preparations so I just casually strolled around capturing what he was up to. 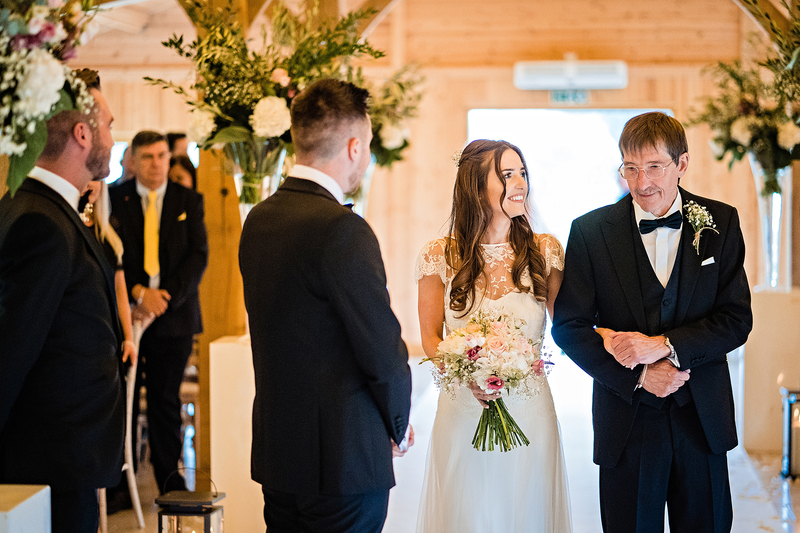 Family and friends present at the Ceremony Barn witnessed Hannah and Gary exchange vows in an emotive ceremony. It’s a wonderful setting to get married it. Light and airy and full of character. 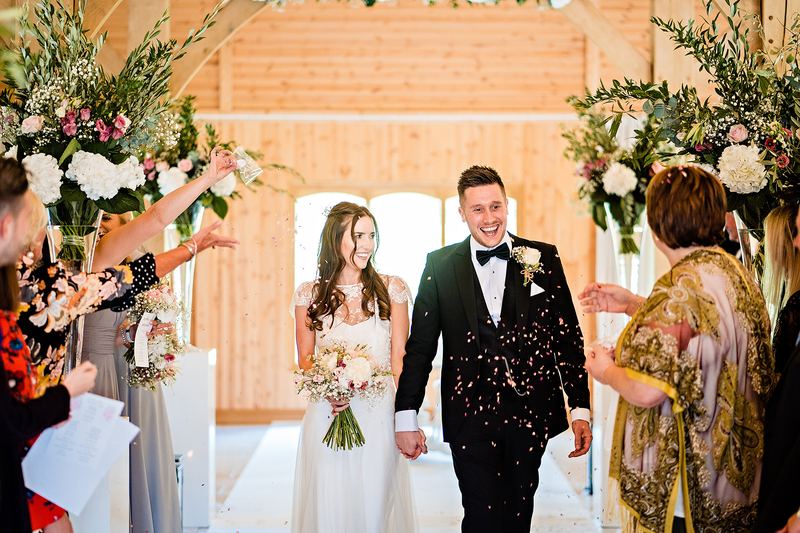 The weather was very inclement so Hannah And Gary had confetti thrown whilst they walked back down the aisle instead of outside. 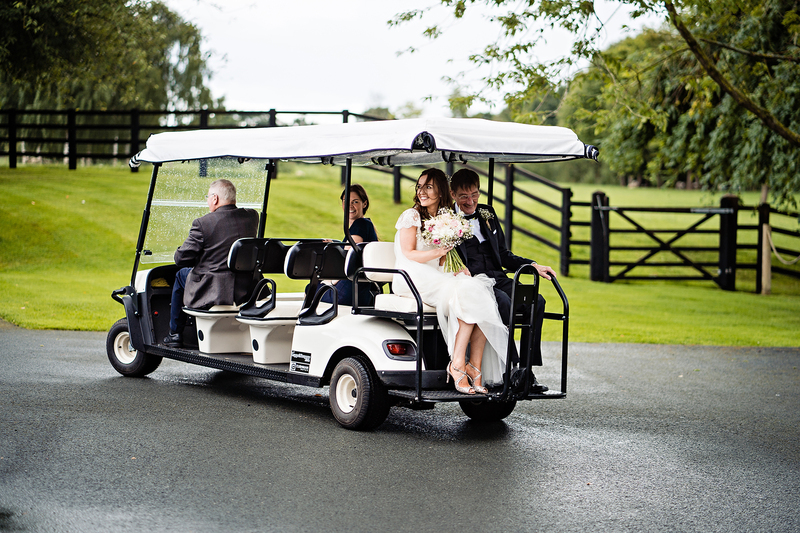 Once they exited the wedding venue it was time to hop on a golf cart and zoom up the drive to the reception. 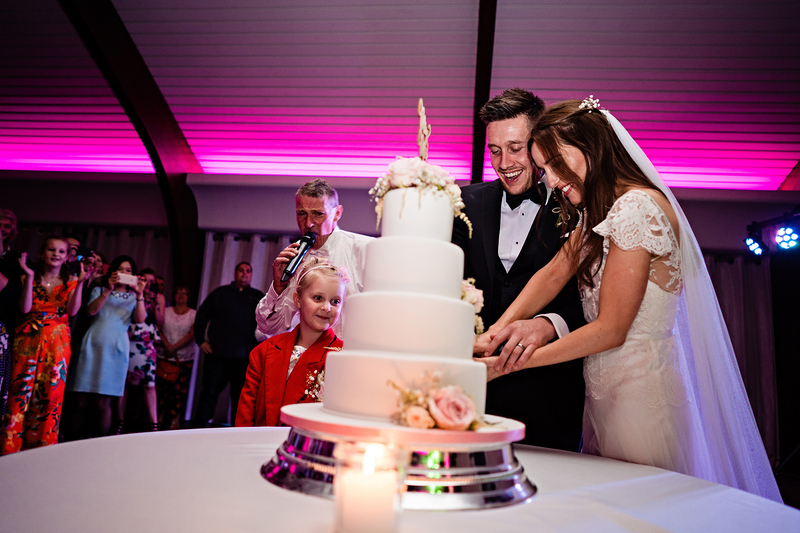 Hannah and Gary enjoyed spending quality time with their family and friends and loved every bit of their reception. 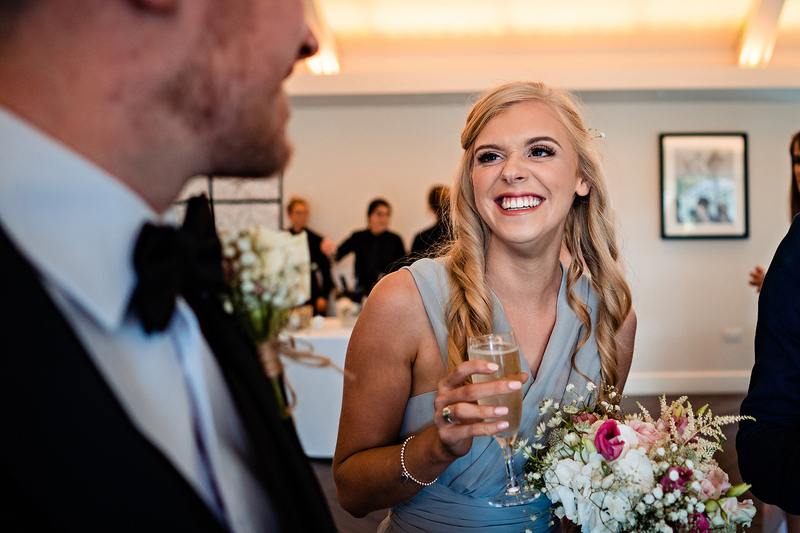 The reception was full of outstanding energy and joyful laughter. So I waited for the perfect timing to photograph as many moments as I could. It was a strange weather day. 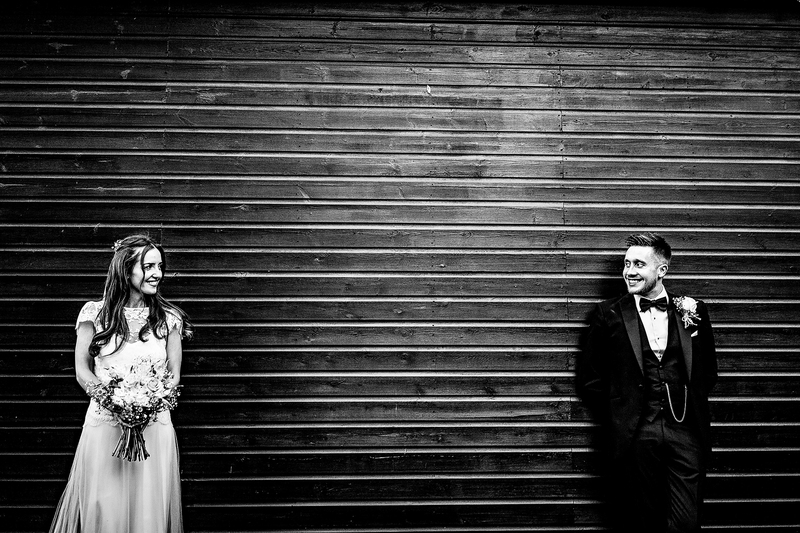 One minute glorious sun and the next it was chucking it down, so we had to choose our moments carefully for popping outside for group shots and portraits, but it did not dampen Hannah and Gary’s spirits, the bride and groom were determined not to let any of the rain affect their day. We even managed to get everyone outside just before the rain for an aerial shot of the whole wedding party. 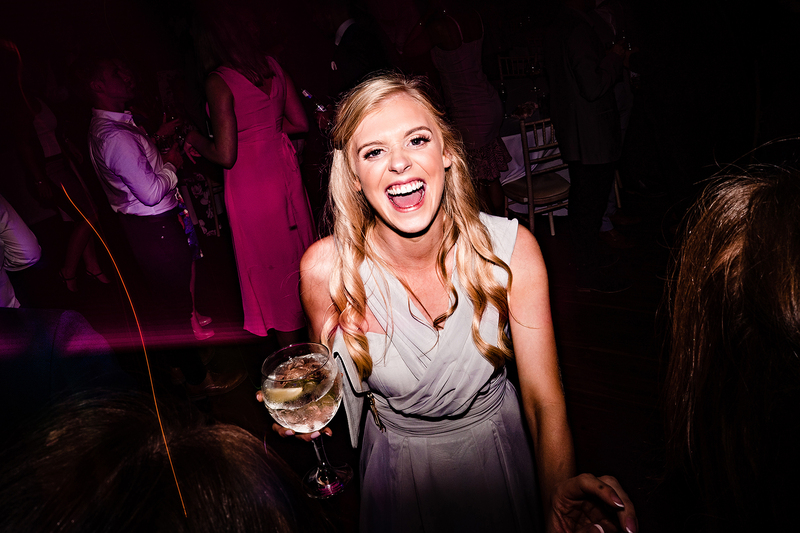 Whilst there is no vantage point at the venue to capture that sort of Colshaw Hall Wedding Photography, you can always improvise and stick your camera on a monopod, lift it up high and use a remote release to capture a wide shot of everyone at the wedding. Which is what we did for Hannah and Gary. 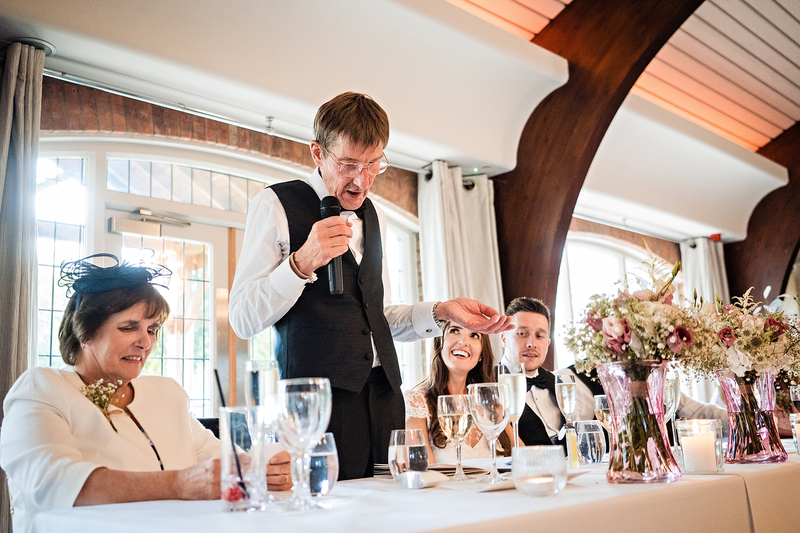 Speakers made their speeches immediately after the wedding breakfast. 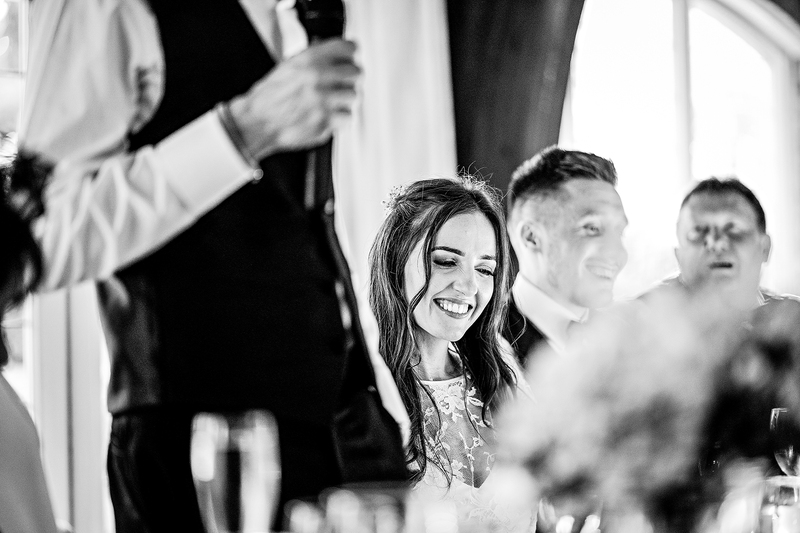 It’s a difficult job for a wedding photographer to photograph speeches, because it’s all about the words, so you have to look for the emotions being reflected in the way people react to the words to tell the story. 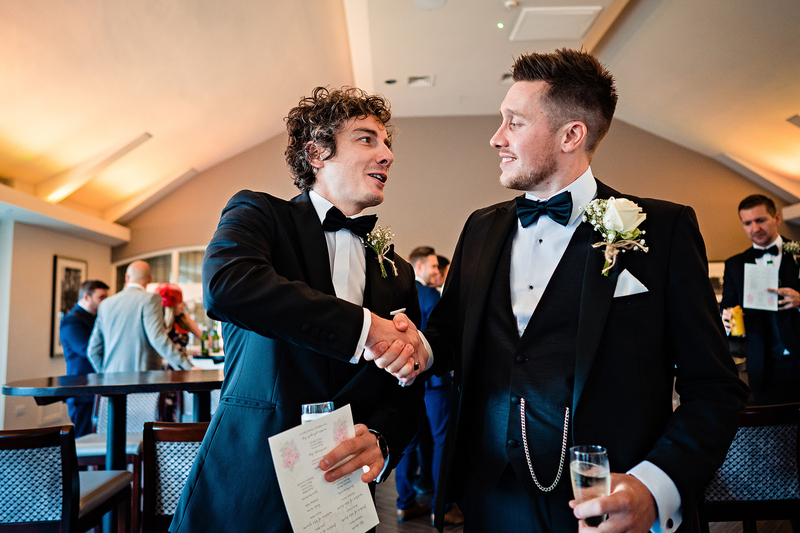 Gary’s best man Fielding gave one of the best speeches I’ve seen at a wedding to date. 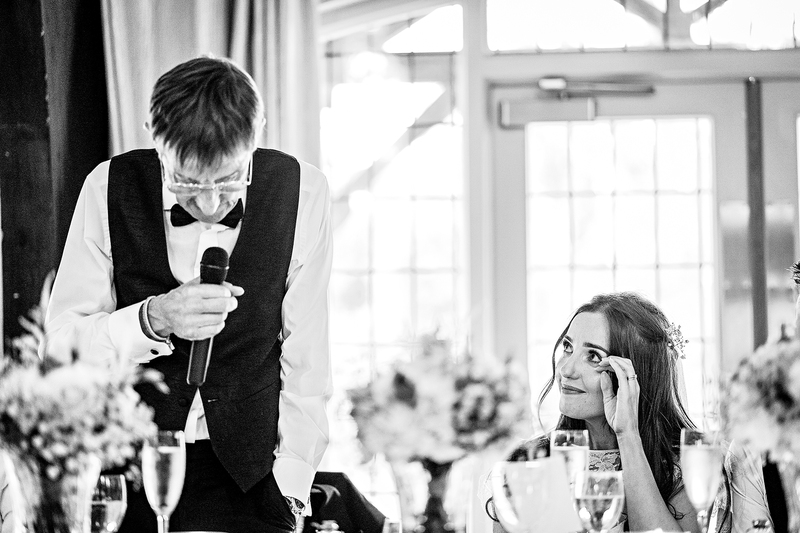 Perfectly mixing popular songs together to help tell the story of how Hannah and Gary got to this day. 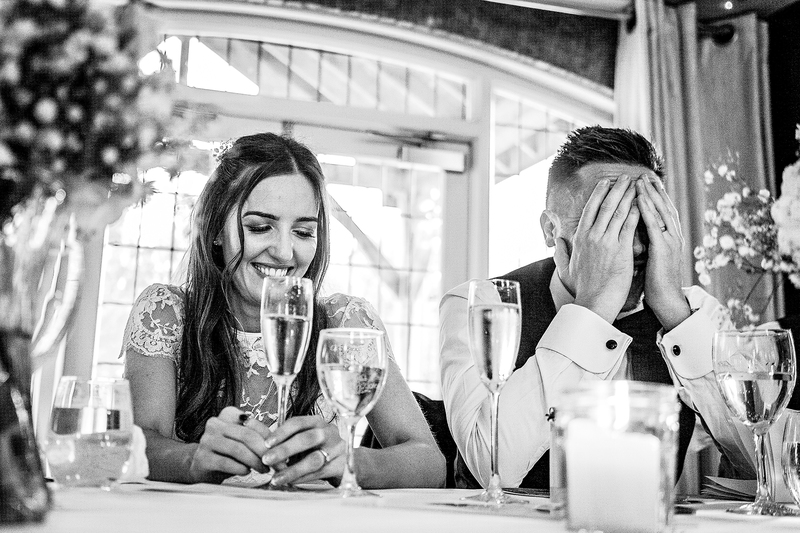 Fair play to him, he had the wedding guests in fits of laughter. We managed to get outside again in the evening once the weather turned for the better. 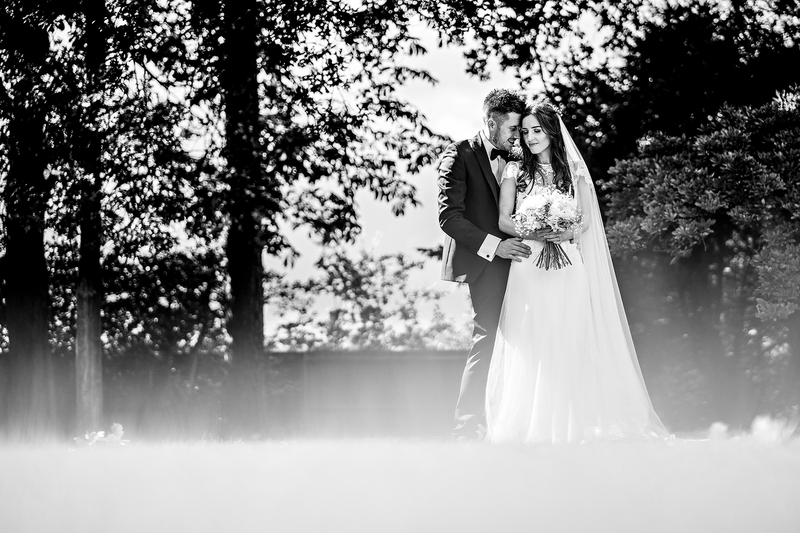 Mix lovely light with a stunning venue like Colshaw Hall and throw in two stunners like Hannah and Gary and you can’t help but produce some lovely photographs. 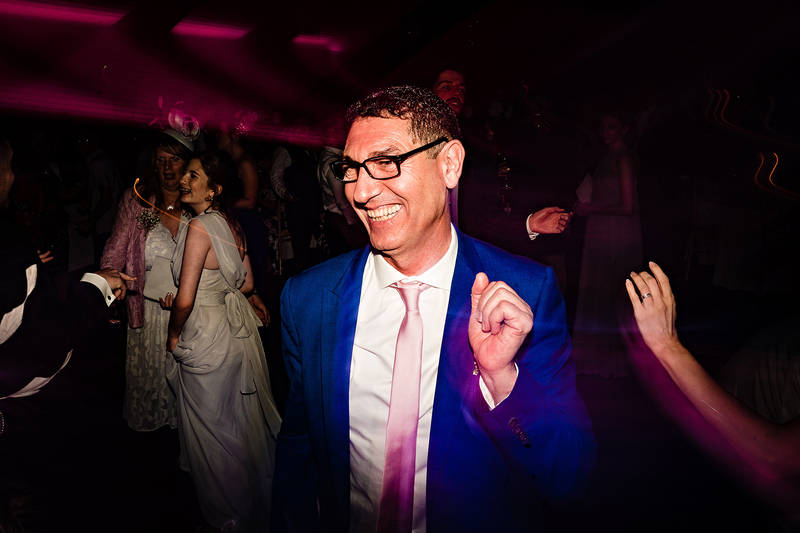 It’s a joy to be invited to weddings like this one and have an opportunity to create storytelling photos that will be treasured for a lifetime. 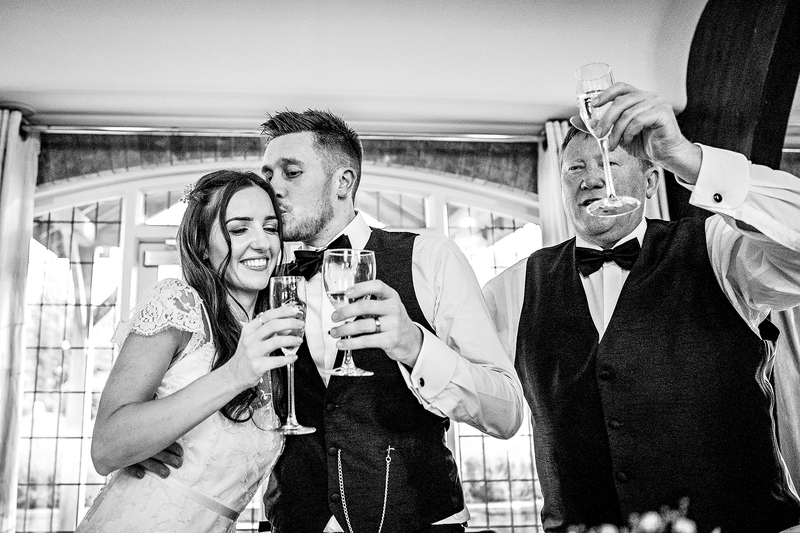 I thoroughly enjoyed capturing Hannah and Gary’s Colshaw Hall Wedding Photography. 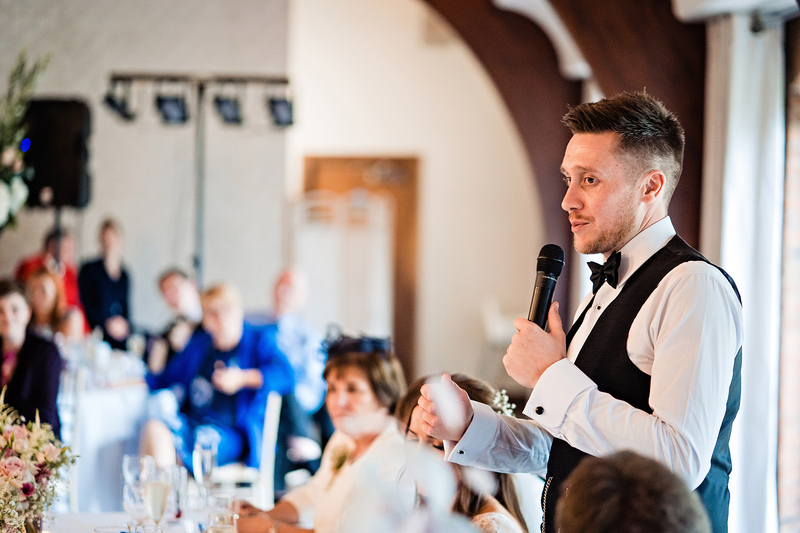 If you are getting married at Colshaw Hall, or any number of other wedding venues around Cheshire, then get in touch to check my availability. 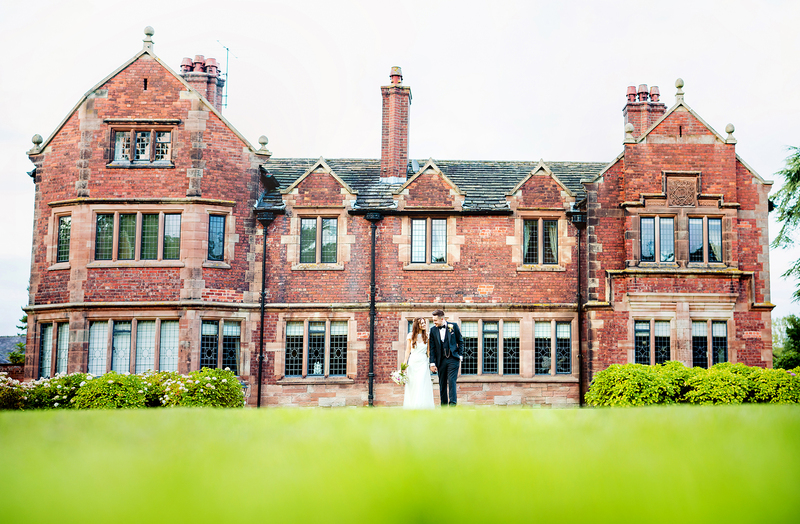 You will find Colshaw Hall in the heart of rural Cheshire, surrounded by rolling fields and beautiful countryside, a truly unique Wedding Venue! 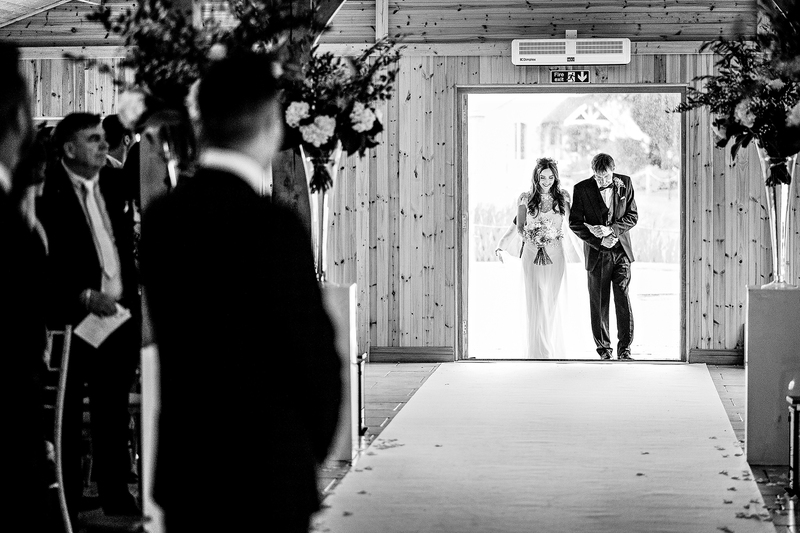 A combination of a house steeped in history and a purpose built contemporary barn. 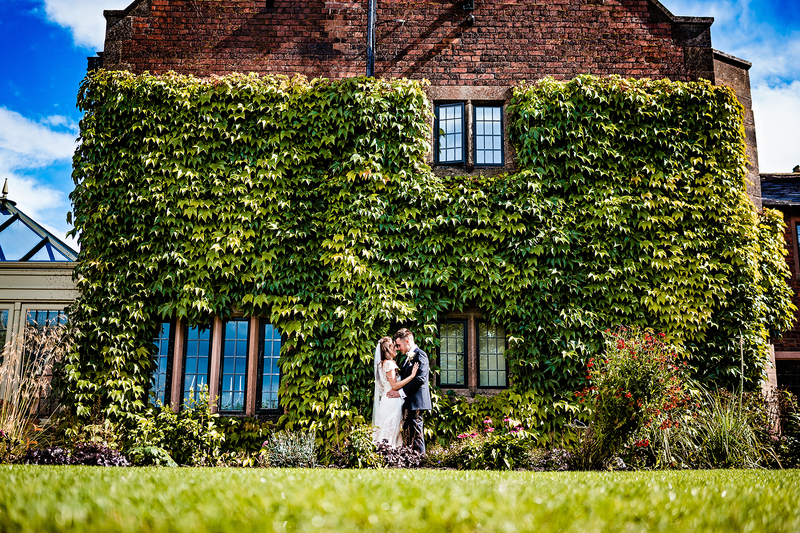 This beautiful Country Wedding Venue in Cheshire is loaded with charm and character. 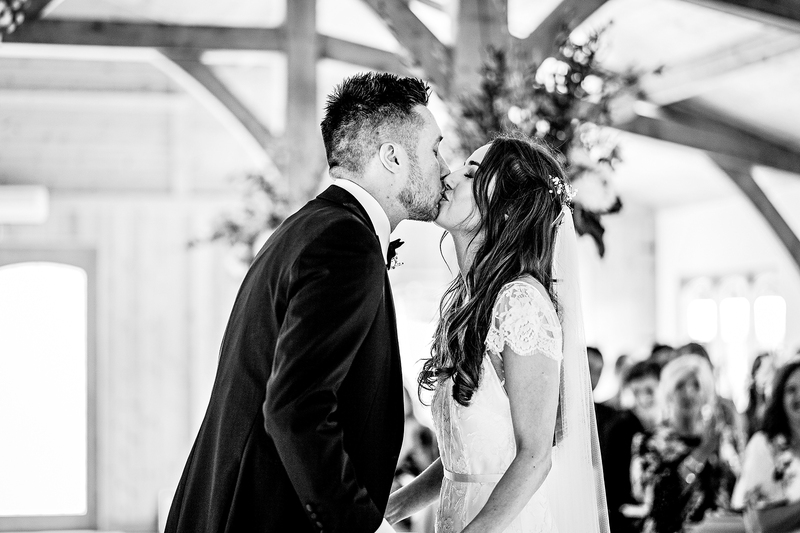 A period style manor house with a modern twist for the reception. 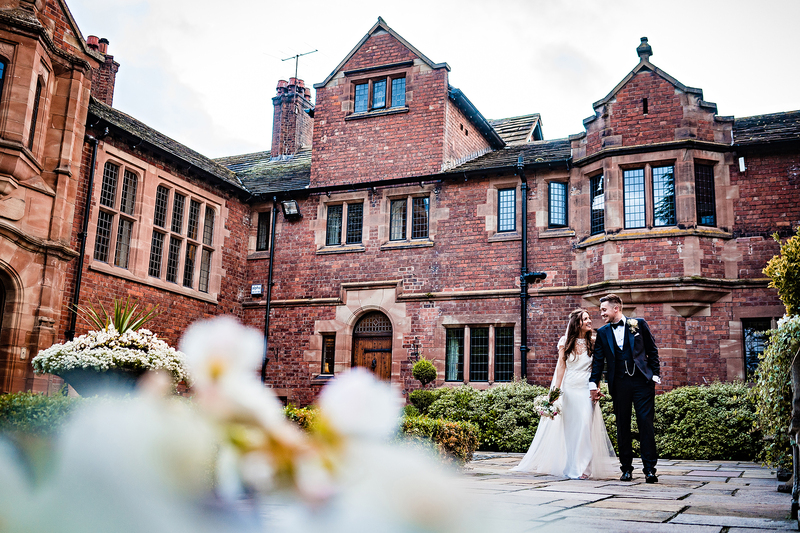 Colshaw Hall is a luxurious and exclusive wedding venue in Cheshire. It has been designated Grade 2 listed status and has been meticulously restored by the Irlam family. 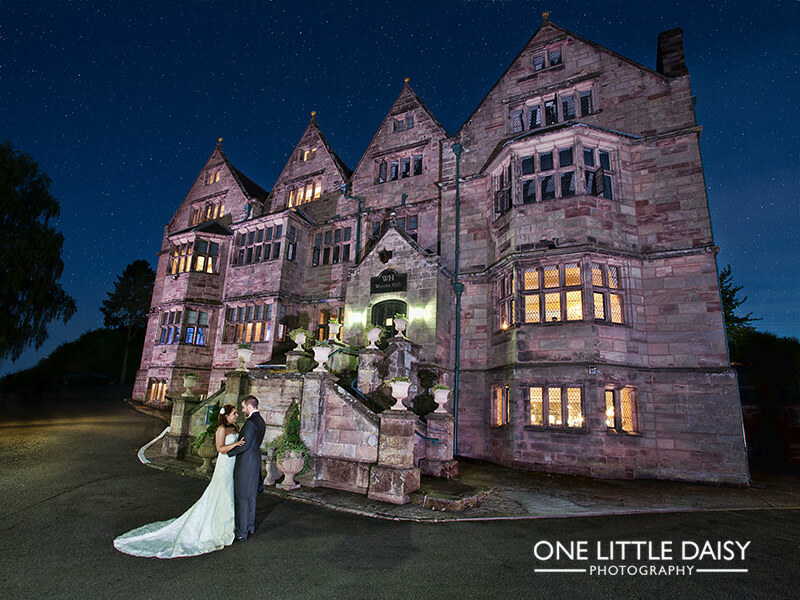 There are many options at this stunning venue to create the perfect wedding. 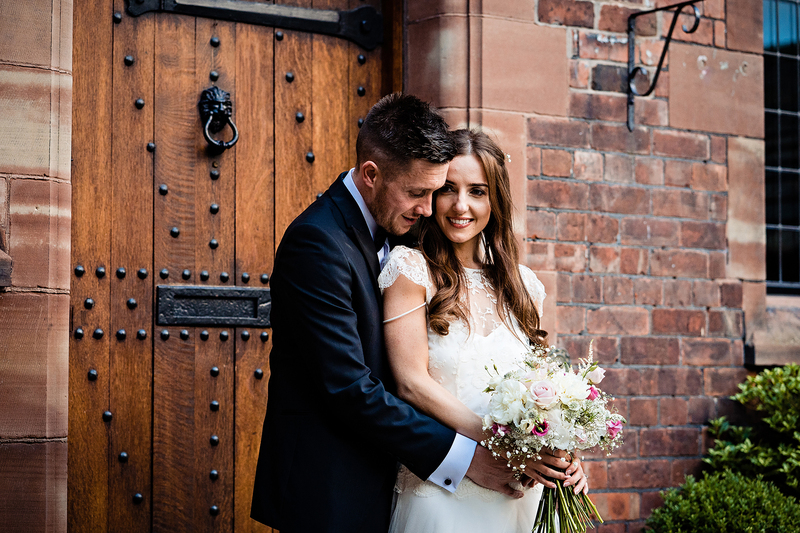 Colshaw Hall is located in a perfect spot, just outside Knutsford and really close to Chester, Manchester and Macclesfield. 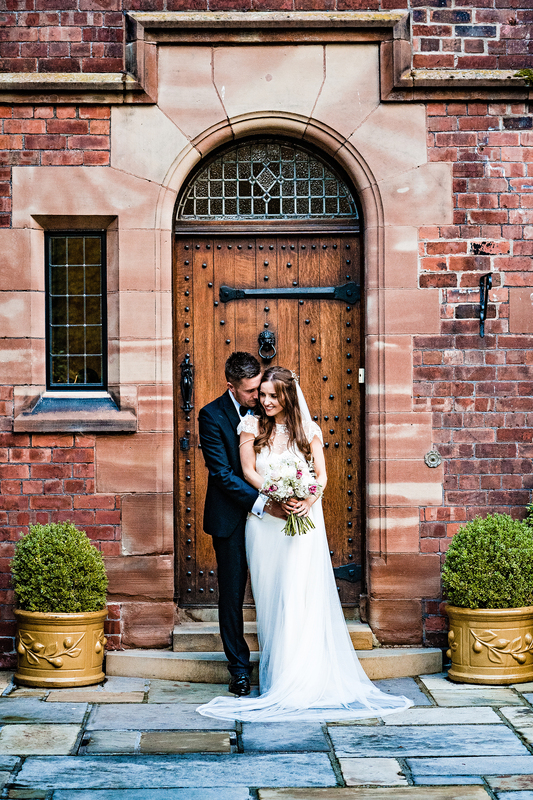 Colshaw Hall is the perfect choice for a unique and wonderful wedding venue or special event in Cheshire. 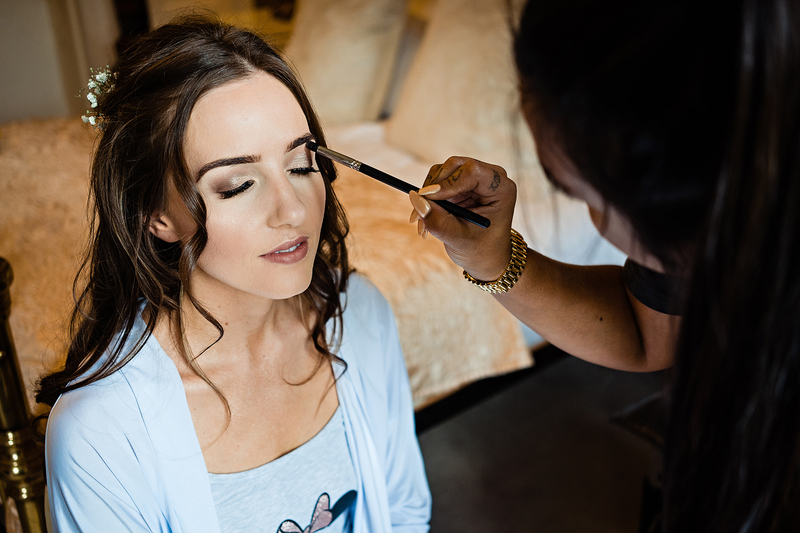 Not only that, the venue is exclusive to you for the entire day, so it offers privacy and peace for your wedding day. No sharing it with the public. 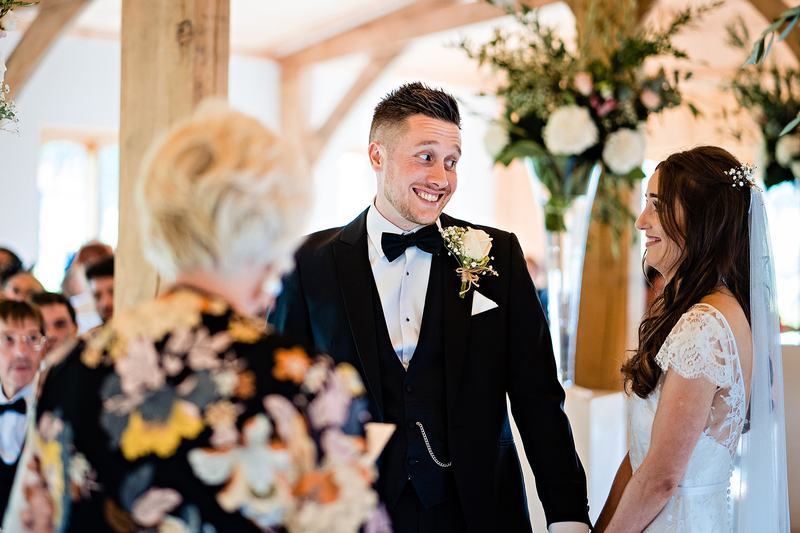 As you arrive at the gates and head along the driveway, you and your guests will start feeling the excitement as you prepare for a once in a lifetime day. 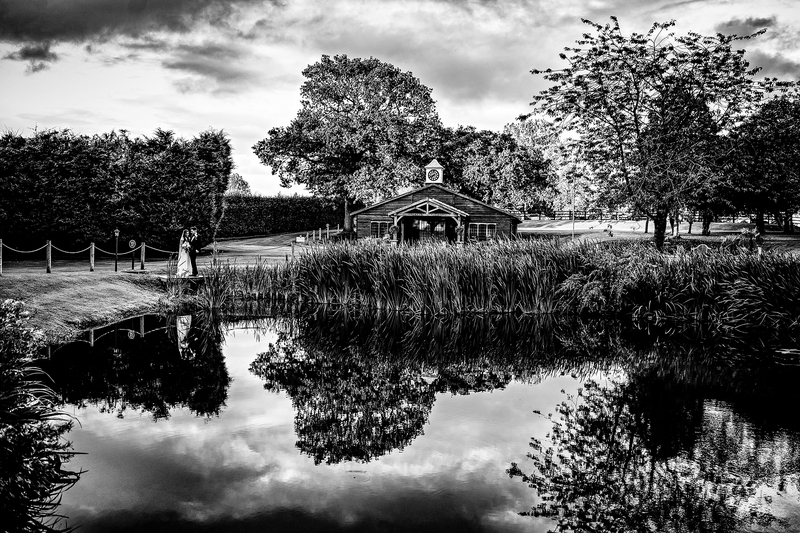 As you approach the building you will head past the lake and Japanese gardens, both of which add a certain level of beauty to the venue. 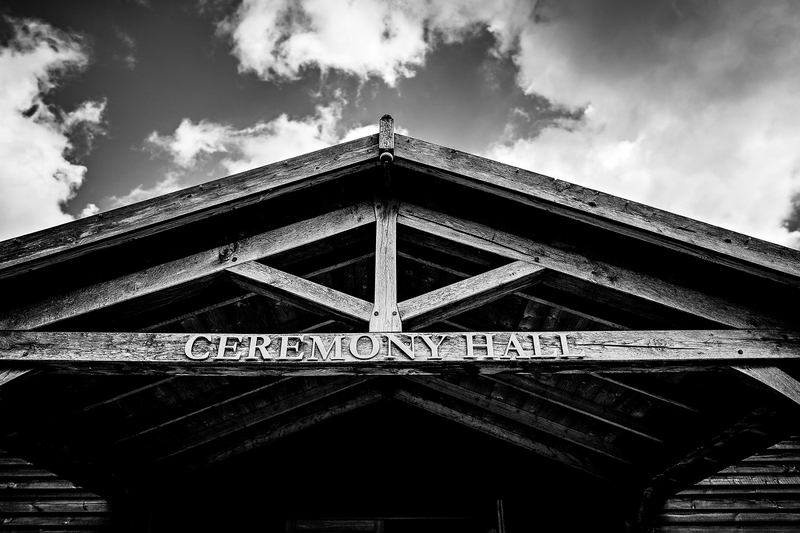 Along with the magical hall is the ceremony barn, known as The Stables, decked out with oak beams and marble flooring. 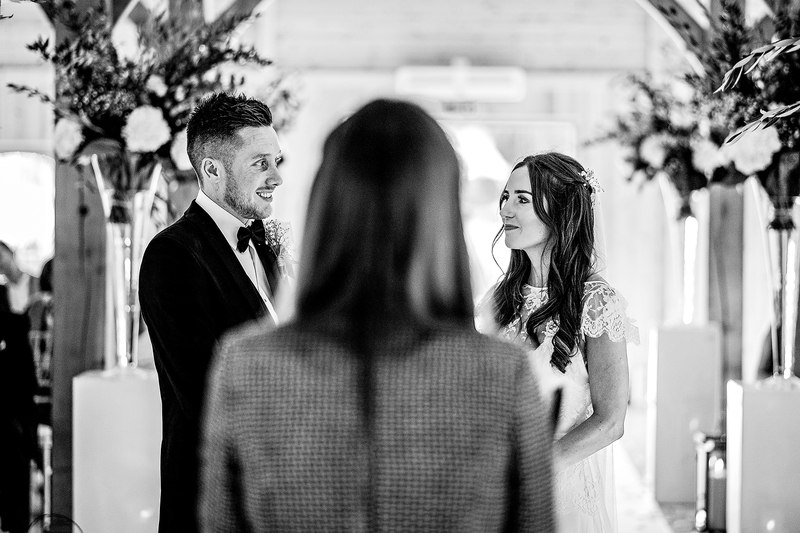 The wedding reception will take place in the Peel suite, a contemporary room with a bar that overlooks the stunning walled garden. 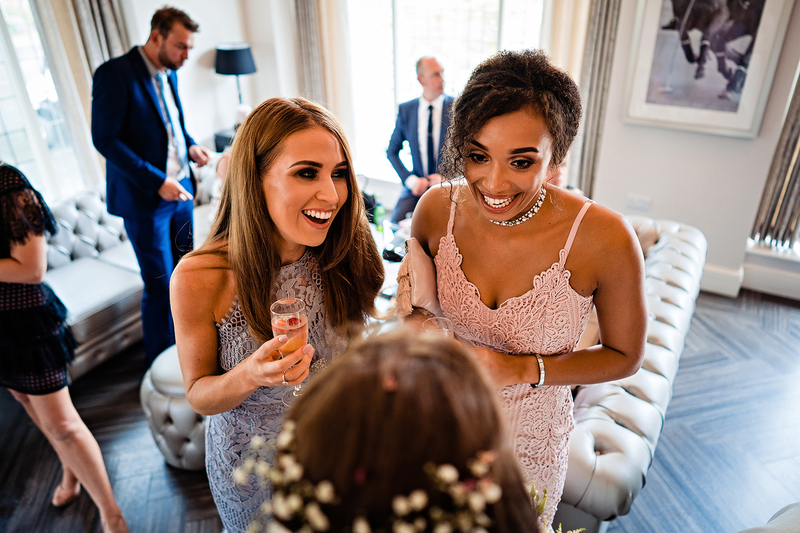 The suite has plenty of seating and a room large enough to accommodate mid to large size weddings, All of this together at one location ensure Colshaw Hall is seen as one of the most sought after venues in Cheshire. Colshaw Hall is steeped in history. 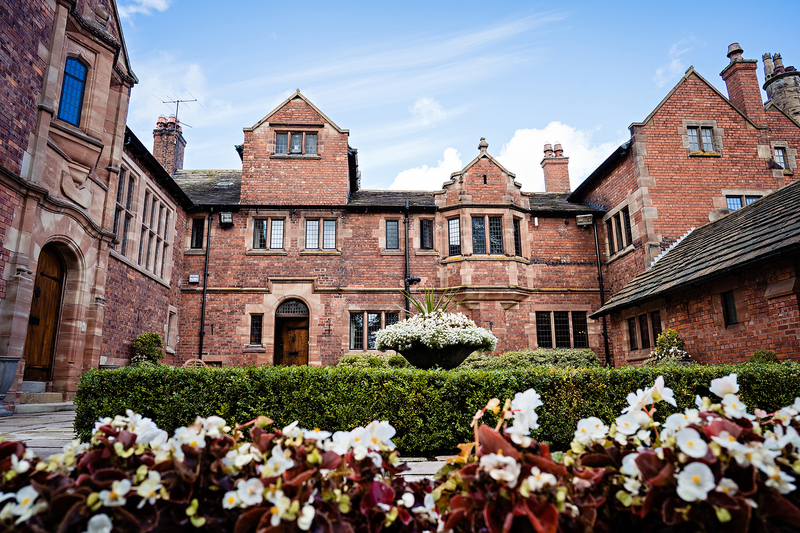 Built in 1903 and designed by Chester architects Douglas and Minshull. It was used as a hospital in the First World War. In the early 1980s it was restored after damage in a fire and some demolishment. The restoration also included building a 9 hole golf course. After a recession the hall was sold to Valerie Edwards and used for sports personality interviews and the like. In 2001 it passed ownership to David Irlam who restored the grounds to pasture and converted some of the building for residence for his family. 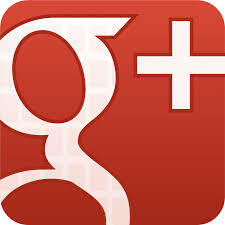 They lived there for a number of years before eventually deciding to move out and begin hiring it out for weddings. 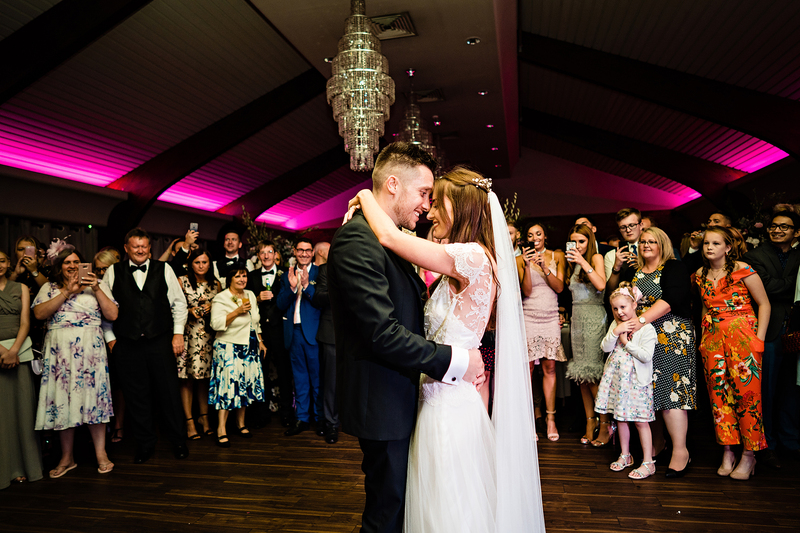 Your wedding day is going to be perfect at Colshaw Hall, enough bedrooms to sleep your entire wedding party and a sumptuous breakfast waiting for you in the unique and light filled Orangery. There is also a range of other types of guest accommodation located in the estate. A choice between the Colshaw Cottages or the Irlam lodge. The gardens that surround Colshaw Hall are magnificent. 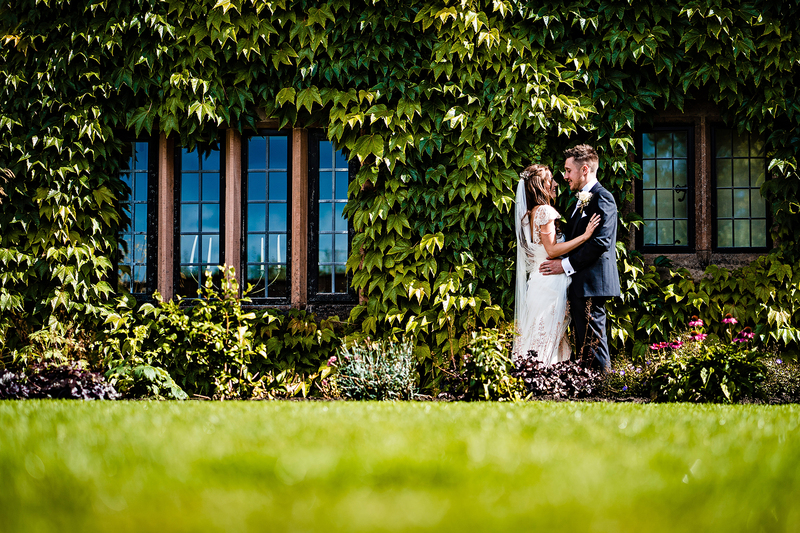 There is the Magnolia Garden with its rolling hills and a plethora of trees and the magical Walled Garden with the ivy crawling up the walls and the inch cut grass. 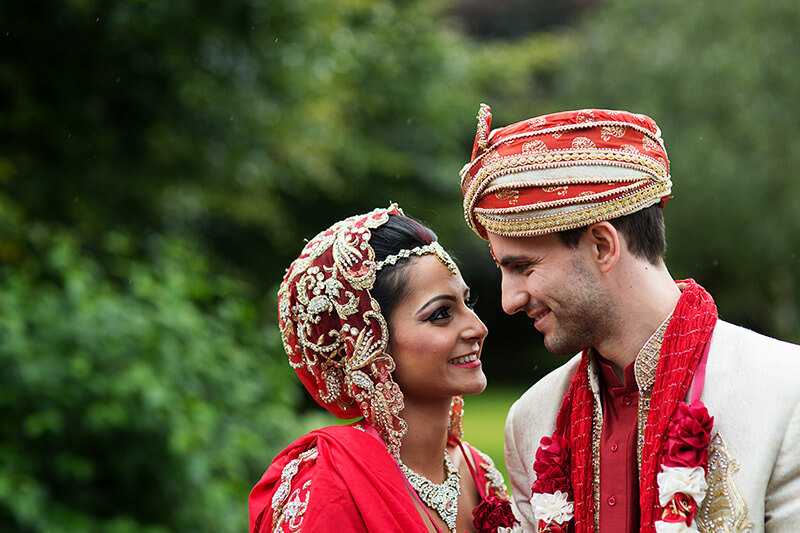 Providing the perfect backdrop for your wedding photos and a delightful place for your guests to explore during the day with a causal stroll. 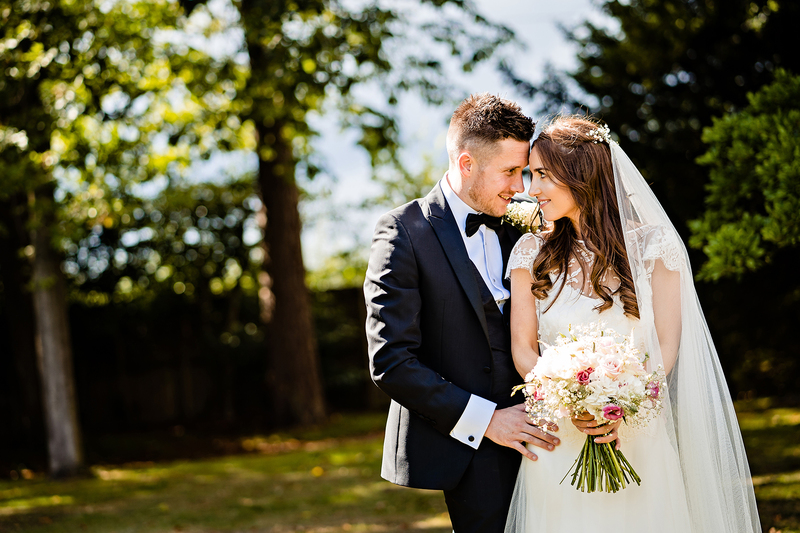 Colshaw Hall has hosted weddings throughout history and their one aim is to make your day as perfect as possible. 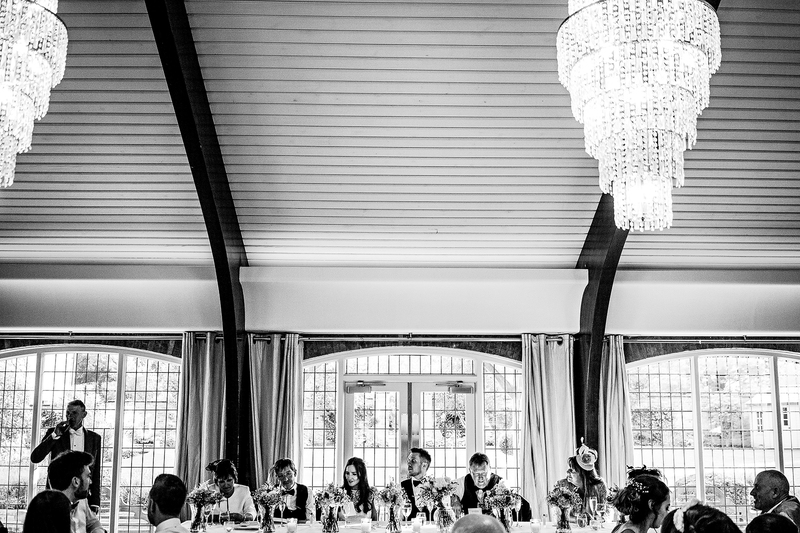 You can’t have a wedding without a wedding breakfast and the food served at Colshaw Hall will make your eyes bulge and your taste buds zing with excitement. 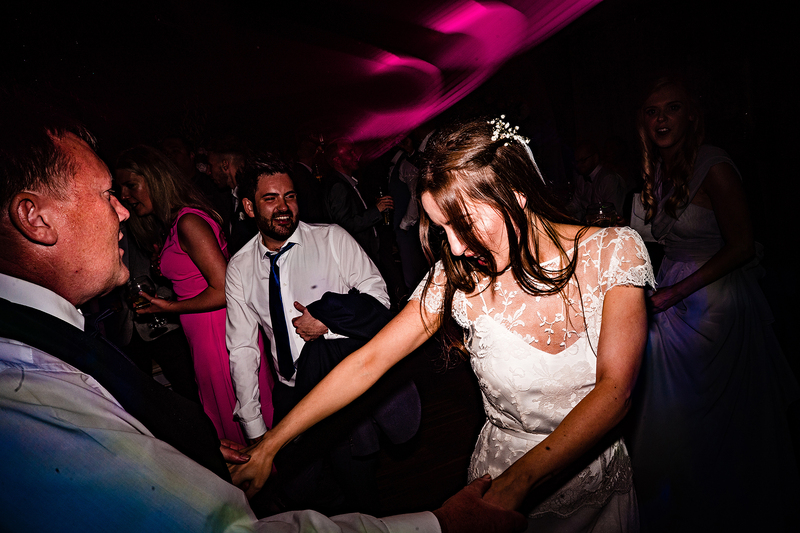 The spectacular Peel Suite makes a grand setting for your wedding reception. Surrounded by gardens it is a joy to behold. 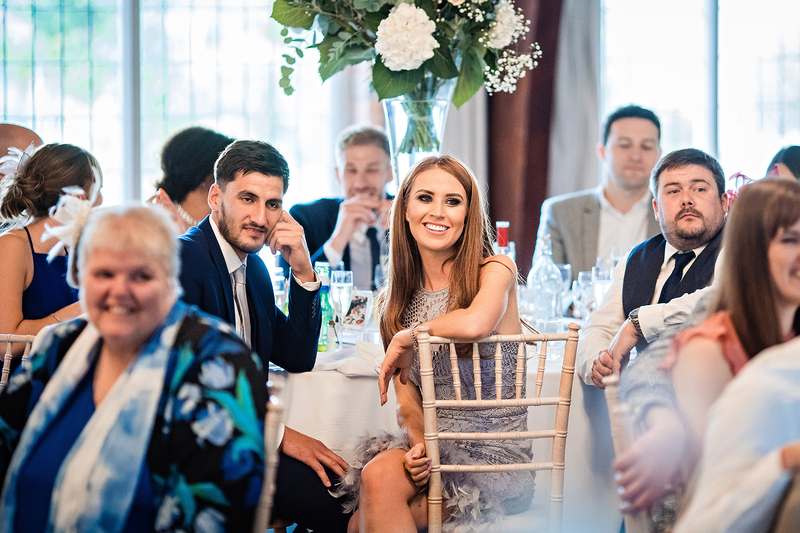 A mix of modern decor, with start of the art facilities, and grandeur that is unbeaten around the area it will be the perfect location to celebrate your newly taken vows after the wedding. 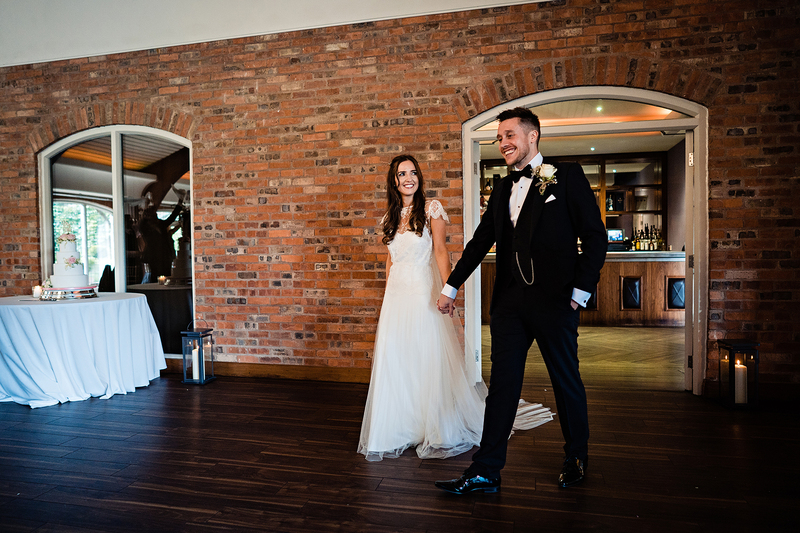 Down one side of the suite is a large glass wall letting in rays of natural light which allow your Colshaw Hall Wedding Photography to glow. 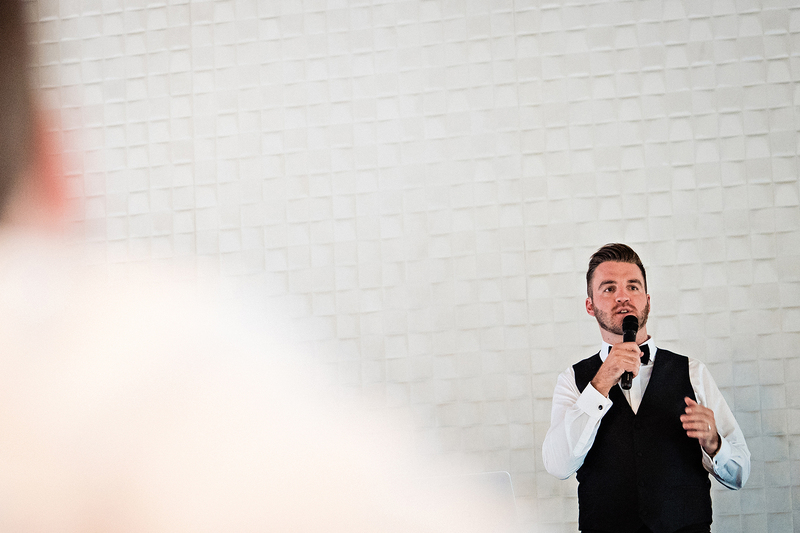 There’s a plethora of facilities to feed and water your guests – a stylish bar and a PA system with projector to enable your speakers to take advantage of high end technology should they need it for their speech. 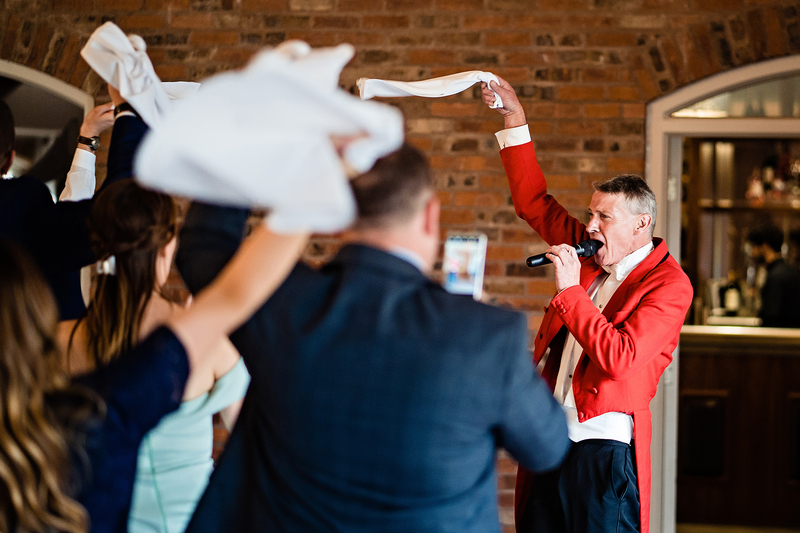 Colshaw Hall has in house caterers to take care of feeding your guests in luxurious surroundings. 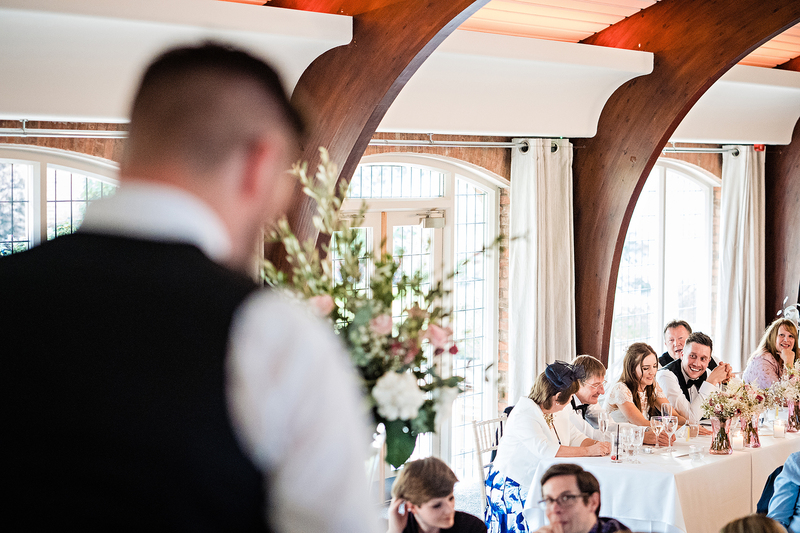 You will have the opportunity to sample the food before your wedding day to ensure the dishes you choose are perfect for your style and season. 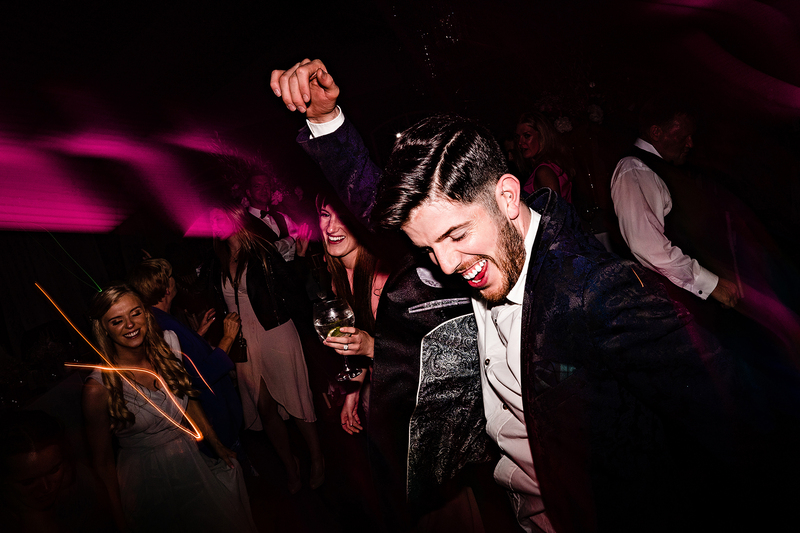 Once that wedding breakfast is safely tucked away in your guests tummies and the speeches have entertained the wedding party it will be time to loosen those ties and put on your dancing shoes. 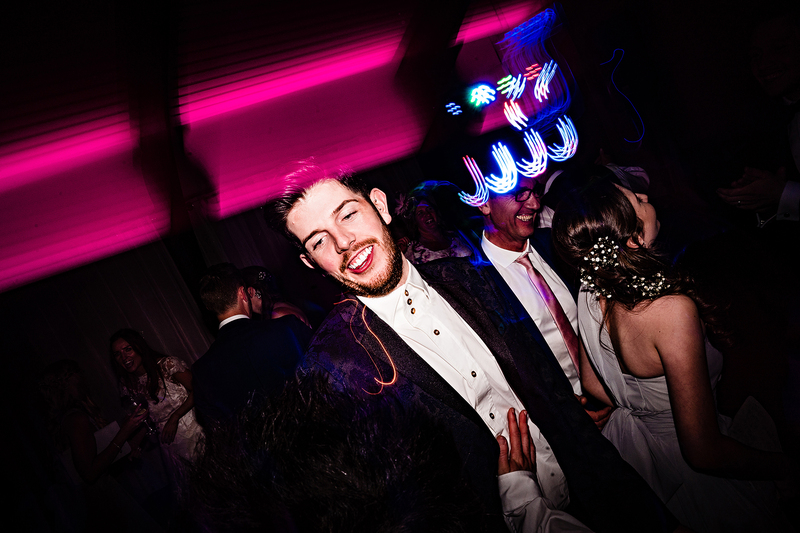 I’ll be there to capture your first dance and once it’s finished I’ll bring out my flashes and work on the dancing part of your Colshaw Hall Wedding Photography. 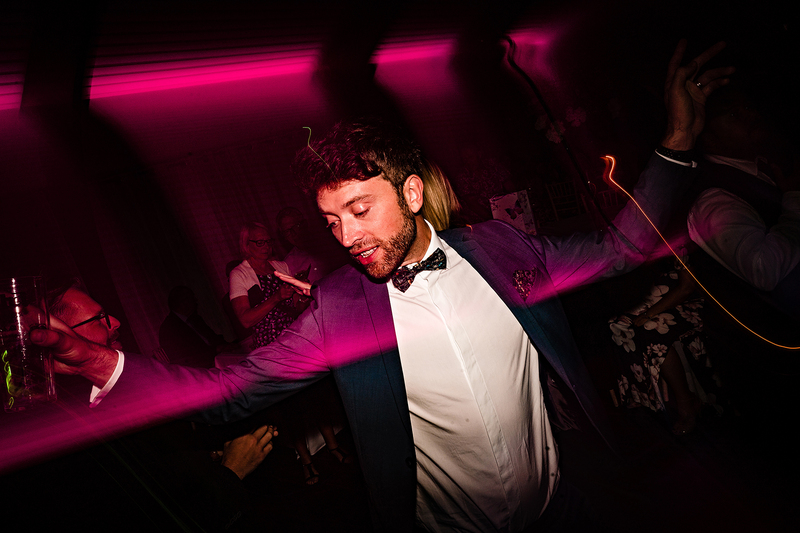 Using slow shutters and awesome lighting effects your wedding photography at Colshaw Hall on the dance floor will take on a new life as each spin, swirl and backdrop will be frozen in time. 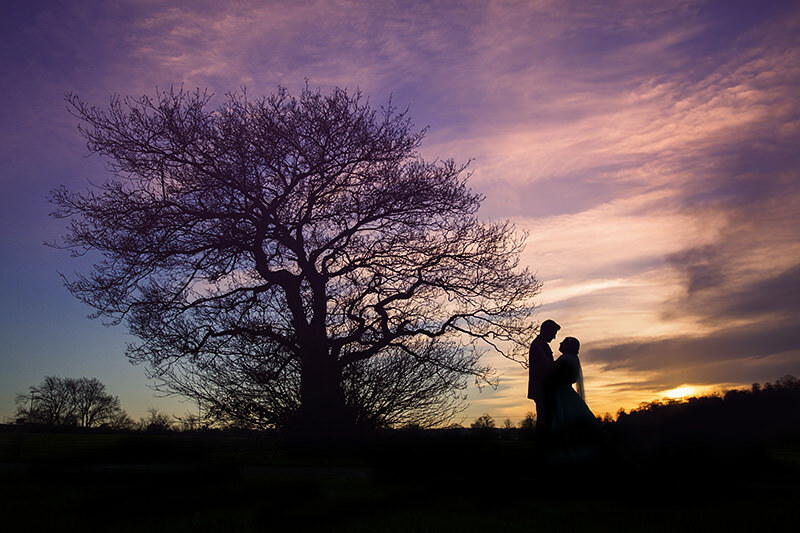 As the sun drops below the horizon and says goodnight until the next morning Colshaw Hall Wedding Photography can take on a new life. 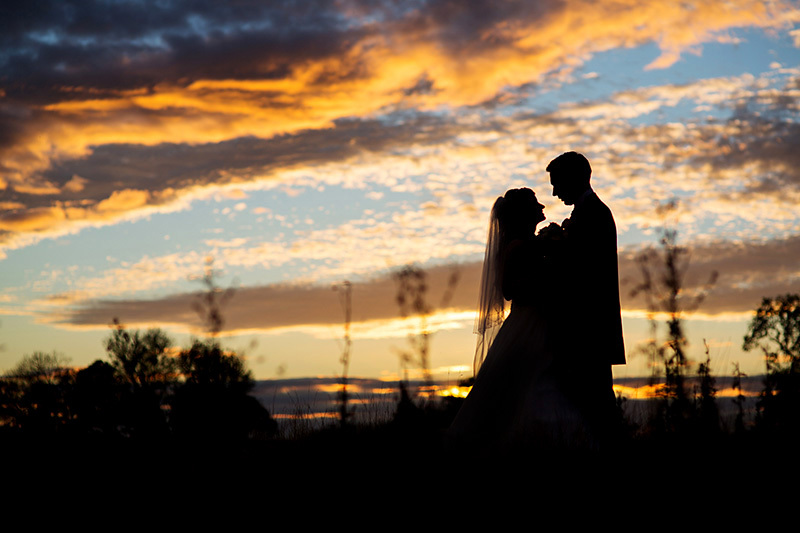 There’s ample opportunity to work with the dying light and capture beautiful sunsets and silhouettes around the grounds. It only takes a bit of imagination and a little effort to come outside and create some pieces of fine art that will stay in your families heritage. 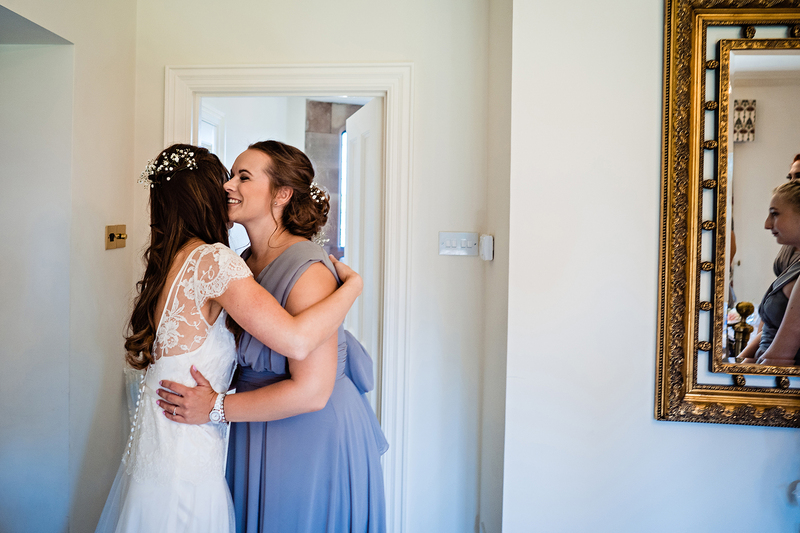 I’ll always have a little glance at the sky before I leave to see if I think it’s worth getting the couple out for some evening Colshaw Hall Wedding Photography. 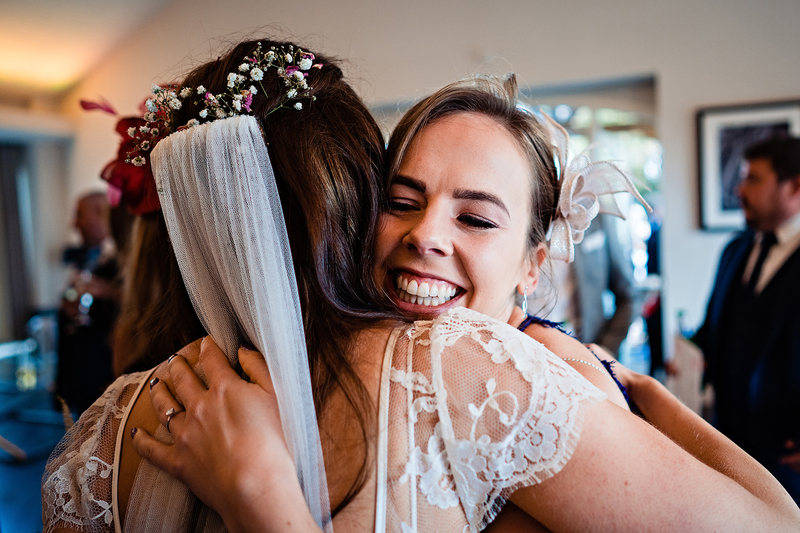 You don’t have to stray too far from the party to find a location that offers a stunning backdrop and a little pocket of light to turn an ordinary photograph into a piece of art. 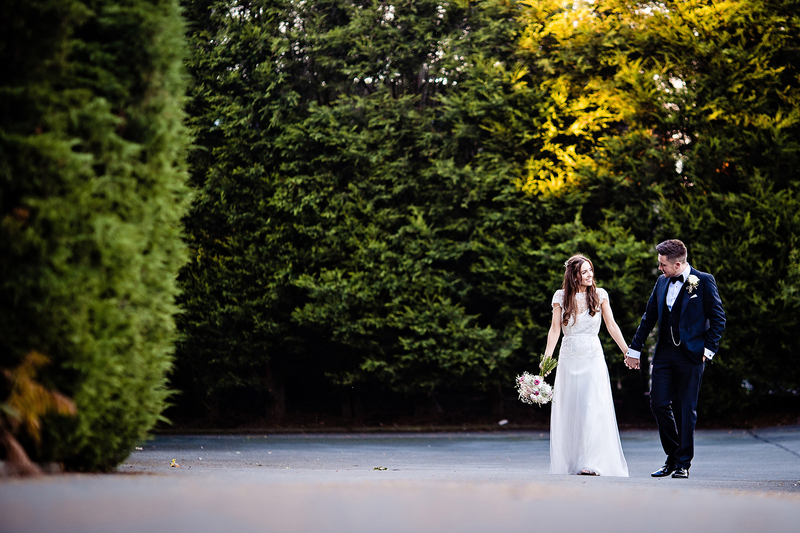 When choosing a venue for your wedding there are a number of factors for you to consider. 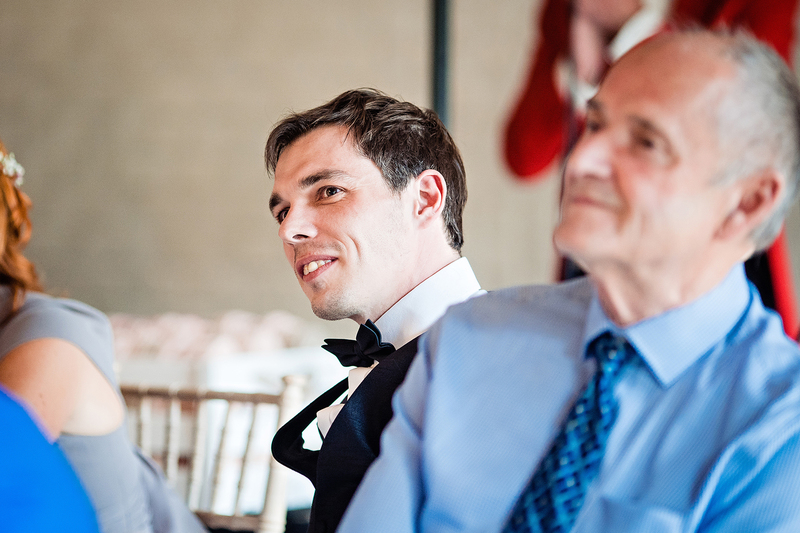 You’ll be thinking about your guests, your ceremony, your evening reception and also accommodation. 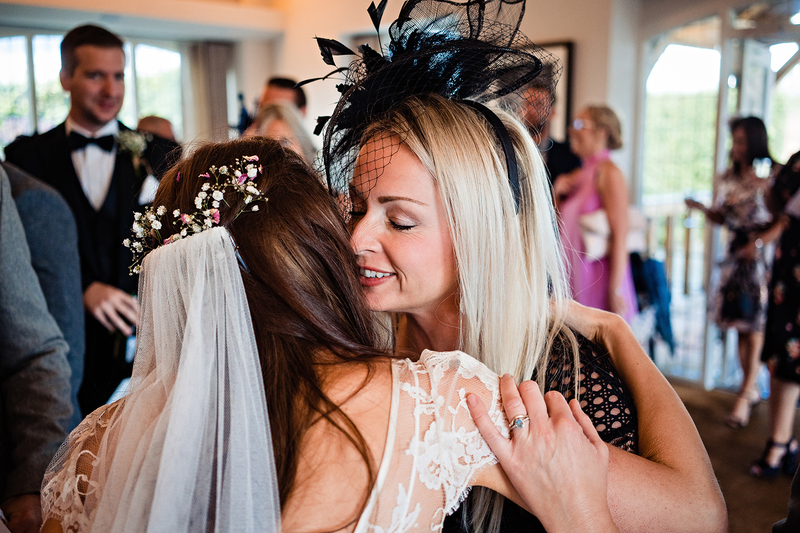 So many decisions to make about your wedding, the venue has to be perfect for you. 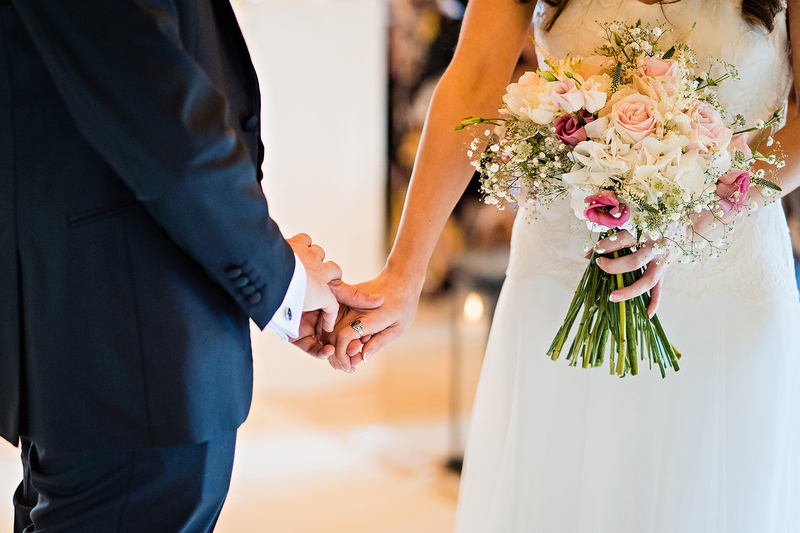 One of the factors that could come into your decision is what time of year you are getting married at. 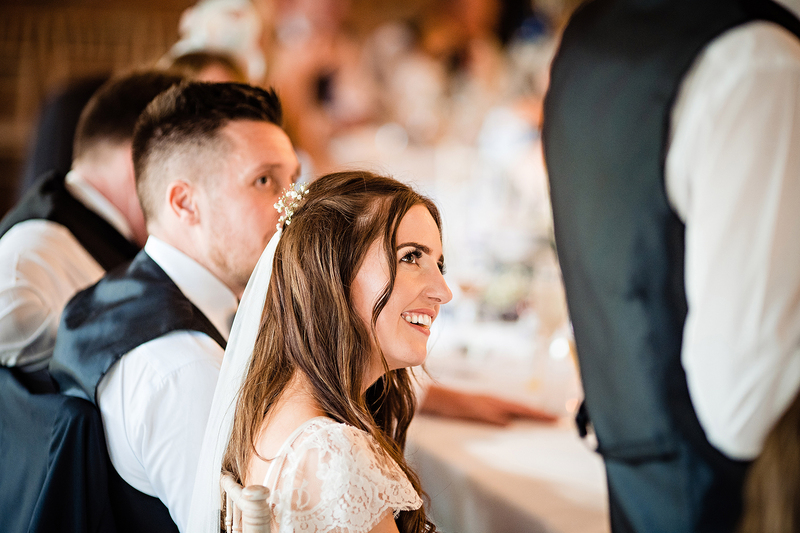 It would be wise to choose a venue with plenty of nice indoor space if you are having a winter wedding for example, whereas a summer wedding you are going to want to spend as much of your time outside in the beautiful weather, so you’ll want a venue with some nice outdoor space. 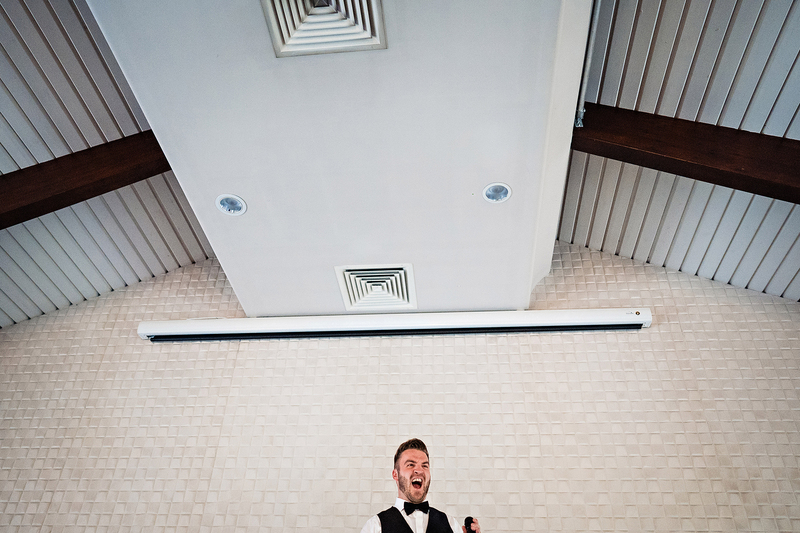 Colshaw Hall has the best of both worlds. 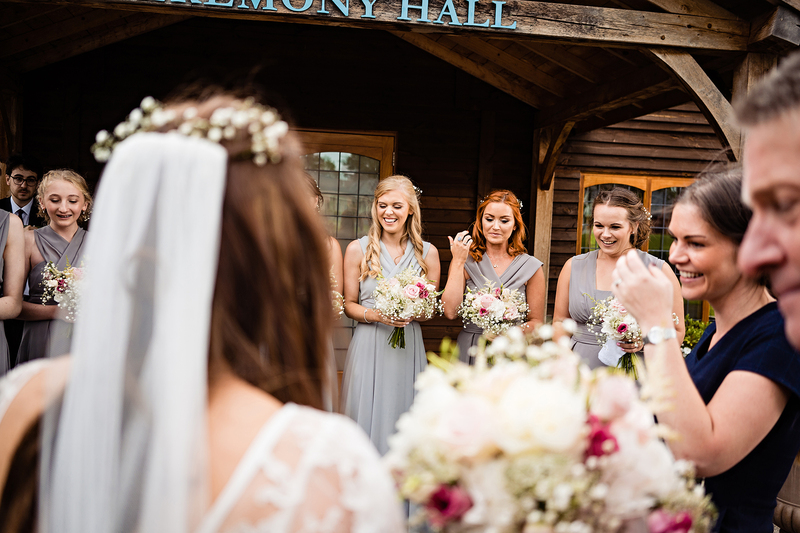 It’s set in acres of stunning grounds to take advantage of in the warm weather as well as having ample space inside for your guests to mingle in cold weather. 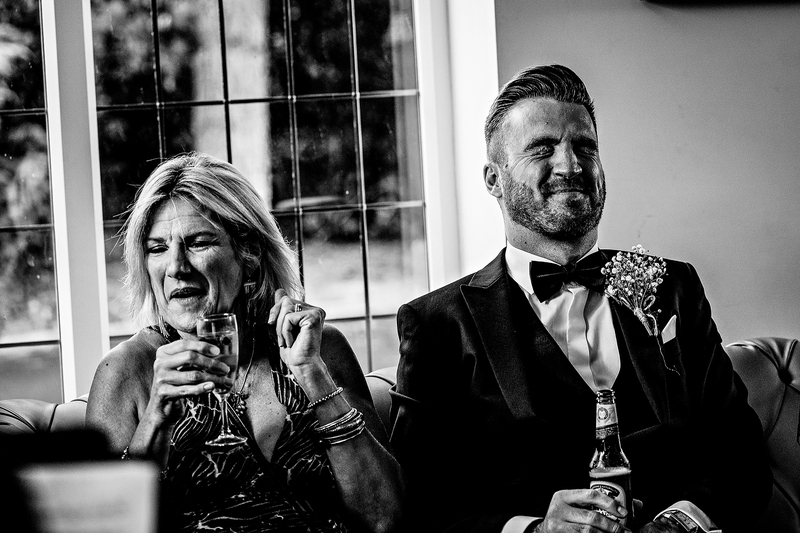 It makes Colshaw Hall Wedding Photography a breeze because the options are limitless. 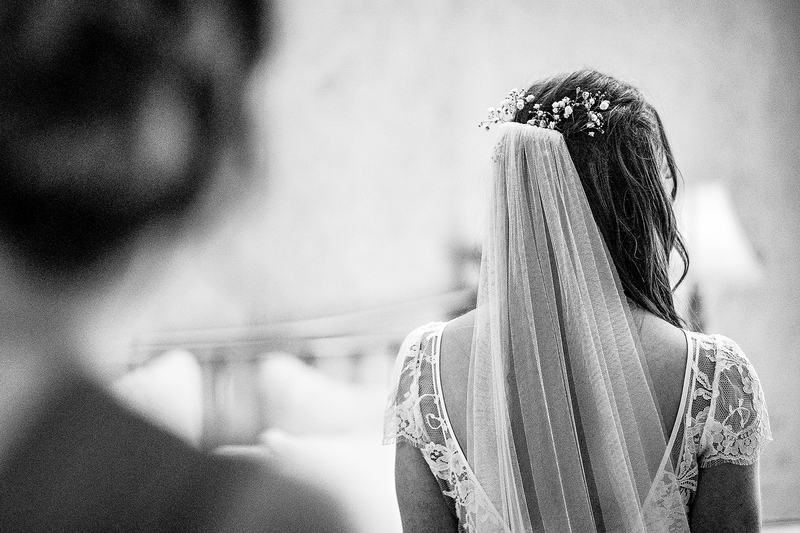 If you are looking for Colshaw Hall Wedding Photography, and looking for natural photographs, then do send me a message to find out if I am available to photograph your wedding.